The Dwarf House, a classic diner-style restaurant, sits nestled away from the roar of the city in a small South Atlanta suburb. Built on old brick from red Georgia clay and topped with a quirky red roof, it looks more like an outdated home than it does a restaurant. For Ellis Hogue, that’s exactly what it is: home. Dwarf House, a humble little restaurant, is actually much larger than its four walls make it seem. It was the first restaurant S. Truett Cathy, the late founder of Chick-fil-A, ever opened. 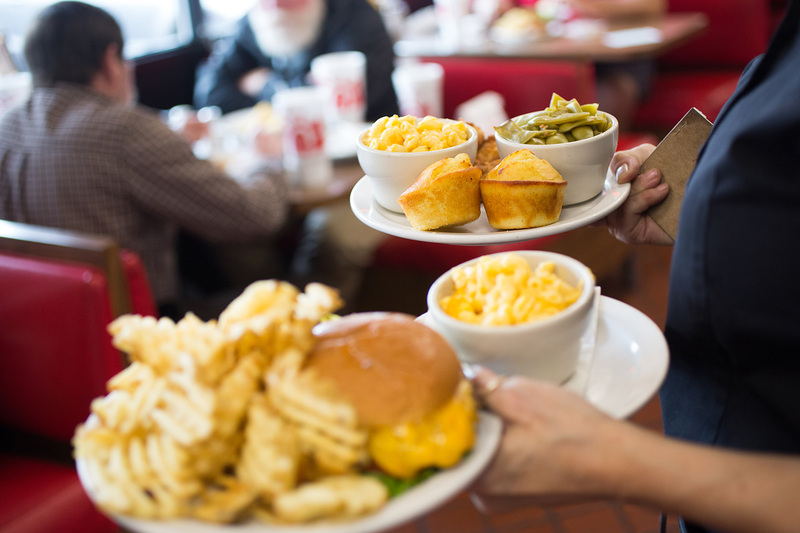 It was here he invented (and his customers taste-tested) what would become the classic Chick-fil-A Sandwich fans enjoy in more than 2,000 restaurants and 43 states today. 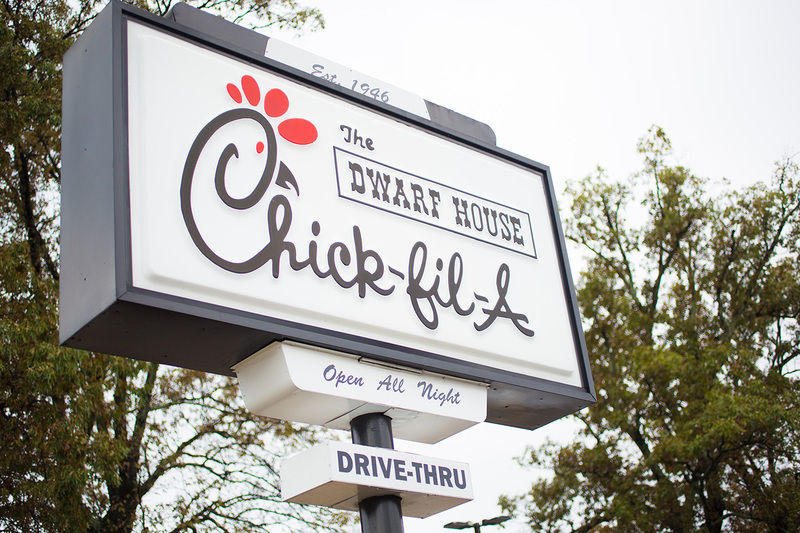 CWhile Dwarf House still serves the original chicken sandwich (24 hours a day, six days a week), it is unlike any other Chick-fil-A restaurant in the country. It’s a diner, complete with a long counter, high stools, waitresses and line cooks preparing the same menu from 1946. Dwarf House staples include the famous Hot Brown (if you have to ask, you need to try it), BLT sandwich, steak and even hamburgers (much to the Chick-fil-A Cows’ chagrin). But it’s not simply the menu that makes Dwarf House special. And that notion holds true decades later. When Ellis Hogue walks into the restaurant, it’s like watching a beloved relative walk through a family reunion. A hug here, a kind word there, a shared laugh – the genuine adoration is palpable. That’s because Hogue, a lifelong Atlanta resident, first began going to the restaurant nearly six decades ago. After school, Hogue worked a number of jobs in the city, from gigs at the state capitol to radio DJ. Hogue, now retired, is an avid 16mm film collector. Amidst all his life changes, one thing has remained constant: the love for his Dwarf House family. Hogue has become such a part of that family that, on the 70th anniversary of the Dwarf House, he received something only six of the restaurant’s most loyal customers ever have – the coveted “Blue Menu.” The Blue Menu grants access to original 1946 Dwarf House menu prices, meaning Hogue can now order a hamburger for 15 cents, enjoy a steak plate for 65 cents and sip a coffee for only 5 cents. 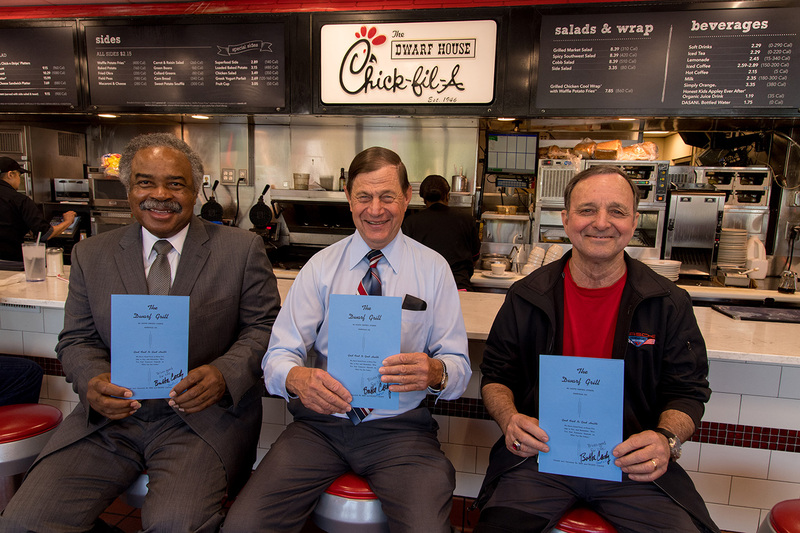 The Blue Menu recipients are selected by the Cathy family, and only two have been awarded in the last 20 years. Hogue (center) poses with two other Blue Menu recipients, Delta pilot Cal Flanigan (left) and Porsche Master Mechanic Jack Swint (right). Delta and Ford (a Ford plant was formerly on the site of the current Porsche plant) employees helped taste-test early Dwarf House recipes. But whether the prices are from 1946 or 2016, Moss believes it’s the Dwarf House family that keeps Hogue, and others like him, coming back. Listen to Hogue talk about the day his Dwarf House family came together during his time of need. But Hogue isn’t the only customer who’s had a long tenure at the restaurant; some have been coming since it opened.